Gutshot goes back to the future! Want to see Sir Sean in all his glory? Click here for a full-size version of the cover! From the old west to the far future, Hawgleg Publishing is riding tall in the saddle as they proudly announce the acquisition of the license to produce a game based on the greatest cinematic masterpieces ever conceived: ZARDOZ! The film, Zardoz, was released in 1974 by 20th Century Fox and starred legendary screen actor, Sean Connery. The film has been a fan favorite for decades, inspiring generations of actors, directors, and gamers with its powerful action sequences, strong allegorical message, and costumes that must be seen to be believed. "We know that it might seem odd that Hawgleg – which is best known for its Wild West Game Gutshot – would acquire a property set in the year 2293," said Gutshot co-creator Mike Murphy. "The truth is, all of us at Hawgleg love this movie and everything it stands for." Game co-creator Mike Mitchell agreed, and admitted a little secret from his closet. "Yes, I've got a red outfit and thigh-high boots just like Sean wears in the movie. I even wore it to a convention once, but the photos were confiscated as part of the evidence used to draft the restraining order that prevents me from wearing it in public." While denying that he aided prosecutors in that case, Murphy conceded that the game, although sci-fi, definitely slid into the Hawgleg stable because the characters ride horses and fire rifles. "Honestly, we've got 80% of the rules already written in the Gutshot Core Rule Book," Murphy said, adding that "we just need to write the game stats for a giant flying head and a mysterious vortex. Honestly, how hard can that be?" Speaking of hard, Mitchell was quick to observe that the classic "red swim suit" uniform worn by Connery in the film would be a prominent part of the rule book's artwork and design motif. "There's just something about that outfit," he sighed dreamily. "And the pony tail! You can't forget Sir Sean's tail!" 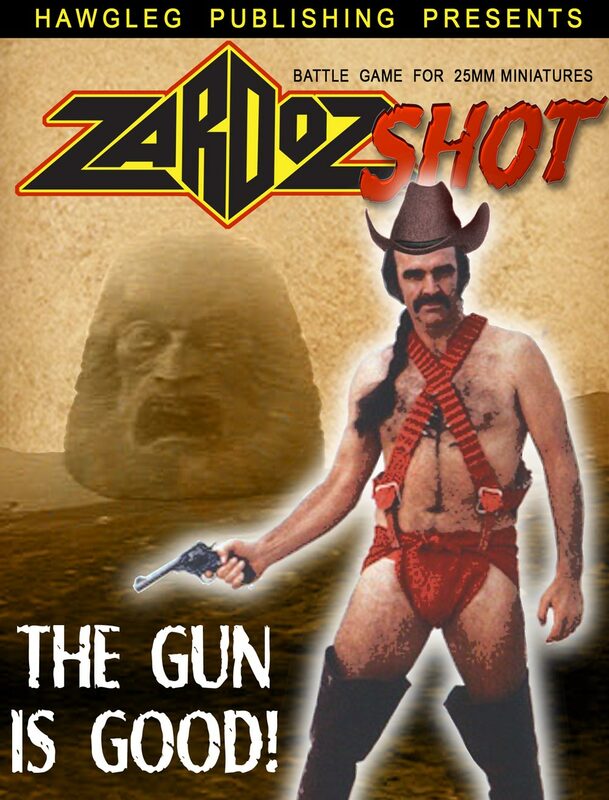 The game will be called ZardozShot, combining the film title with the second half of their signature logo for Gutshot. "Them Hawgleg boys got a burr under their saddle and started babbling about this movie a few months ago," said company spokesman Ole Doc Murphy. "It happened one night while they was drinkin' rotgut and watchin' movies on that there Dee Vee Dee contraption. Next thing I knowed, they was pesterin' 20th Century Fox about getting' the rights to this movie." The initial call was met with incredulous laughter, Mitchell recalled. "We actually called director John Borman and he was giddy with laughter when he heard why we were contacting him. I suppose they figured that we couldn't come up with enough money to buy the license to produce a game based on such an unforgettable film," Mitchell said. "But when they realized we were serious, they jumped at it and we were able to hammer out the details 'before we changed our minds.' "
The Hawgleg boys were anxious to see the 75-year-old Borman, and were even prepared to offer him a staff position, but he declined to meet in person. "He seemed willing to meet, at first," explained Hawgleg partner Paul "Mad Dog" Mauer. "But when I warned… er, told him that the Mikes also wanted to talk to him about adapting certain parts of his other movie, Deliverance… well, let's just say that he decided to keep his distance"
Although disappointed that they wouldn't be able to get Borman to work on their staff, they quickly recovered and hit the road to get the blessings from the movie's star, Sean Connery. They finally met him in a tea room in a famed German bar known as Der Manhole. "You've got to be kidding?" Connery asked, taking a long drag from his hookah. As the blue smoke formed in little puckered rings around his head, he seemed to be sizing the two game designers up then down. "Sir Sean was struck utterly speechless when we told him why we were there," Mitchell said. "Until I whipped it out, I don't think he believed we'd go through with it. But, when he saw how small and cute it was, he quickly came around." Connery was immediately impressed by the quality, noting the detail on something so small that it rest easily in the palm of his hand. The War Store "Thanks to Neal of The War Store for letting us use his Z miniatures for our sales pitch," Murphy said. "We'll also be teaming up with him to produce more miniatures from the movie." Nevertheless, it was a hard sell to get the great actor on board. Once he saw the check, however, he quickly climbed on board with the two Mikes. "Throw another zero on to the end of this, and I'll wear that damned red Speedo again!" he said in that dreamy Scottish brogue of his. When the two finally cleared customs ("never get back in line at the strip search," Mitchell warned, "they really don't like that") and were allowed to re-enter the country, the two got down and dirty working out the details on ZardozShot. Among the logistics that need to be worked out is a planned expansion of the company's product line from just printed rule books to include miniatures and terrain pieces. One of the key pieces that need to be produced is the Zardoz head itself. For this, the Mikes approached resin caster extraordinaire Mike McGraw, best known for his Arnica, Montana Wild West buildings. "We definitely want McGraw to give us the kind of head we want," Mitchell said. "We really didn't even consider anyone else. I mean, his reputation really preceded him as someone who knows what he's doing and really getting in there and sticking with the job until it all comes together." Even with yet another Mike on the project, the Hawgleg boys couldn't just sit back and enjoy themselves. "We've still got to hammer our agreement with Neal The War Store Guy about using his Z miniatures, and he's known to drive a bargain that's both hard and unrelenting," Murphy said. "Plus, we'd really like to get him to recast the figures so it will fall in line with our proposed new scale, 31.66 mm." And then there's the task of putting the book together. The book should be a very standard 8.33 x 11.21 inches, run about 1,731 pages with a holographic foil stamped cover and a special scratch-n-sniff section based on the smell of sweaty Speedos and horses. It should retail for about $69.69 a copy and be released sometime in June 2293. Yup, that's all because, once more, this is just another lame April Fool's Day story! There ain't no book and Mitchell totally and absolutely denies that there is a restraining order about him wearing the Zardoz costume in public. And, once again, we apologize for drinking and typing! Have a good one, folks!